A remarkable contribution to the fields of positive psychology, coaching and leadership. A remarkable contribution to the fields of positive psychology, coaching and leadership. Applying the principles in this book will help you discover and leverage your strengths, improve your relationships and fulfill your potential—and help others do the same! 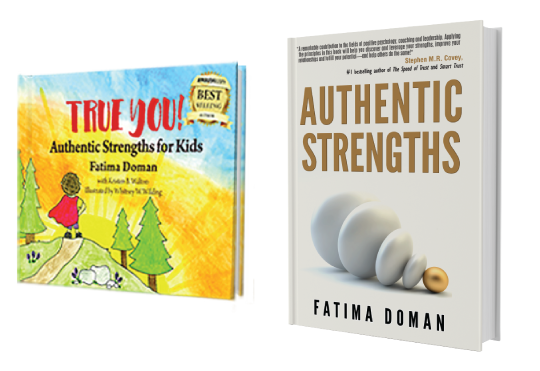 As a health and wellness expert, I find Fatima Doman’s book Authentic Strengths to be an indispensable coaching guide for anyone wanting to increase their own wellbeing or the wellbeing of others. Doman brilliantly illustrates practical and proven strategies that empower people to recharge all four aspects of their being—mind, body, heart and spirit. This book is a must-read if you want to leverage your strengths to create a more vibrant and fulfilling life! I love this book and highly recommend it! Everyone should read it to learn to focus more energy in a positive way on their strengths. This book can shift one’s mindset to look more for the good in themselves and others. By synthesizing evidence-based research and real-life stories, Authentic Strengths provides a brilliantly accessible toolbox for leading a happier, more successful life. This is an important book for you – if you are interested in making the most of your gifts and talents! Finally, an experienced voice in the world of leadership and personal coaching has built a model of personal growth that fully leverages the powerful set of tools we all possess – namely, our strengths of character. While other books on coaching make reference to the importance of building upon and building up personal strengths, this book is the first to make this strategy explicit and to unpack it practically for coaches. For a practical guide to helping your clients use their strengths of character to determine and pursue meaningful personal goals, read this book! Dr. Mayerson’s foreword clearly lays out the value of this book, predicting it will soon be “at the vanguard of establishing coaching excellence”—I could not agree more! As the founder and Faculty Director of Columbia University’s Coaching Certification Program, and as an executive coach and consultant with more than 30 years of experience, I found Ms. Doman’s ability to integrate theory, research and practice impressive, relevant and an important contribution to the emerging field of executive and organizational coaching. It is my hope that each reader gains the insights I’ve gained from this book and I will add it to the set of core resources that guide my professional coaching practice—congratulations Fatima on a job well done, two thumbs up! This book will help you reach your goals in a deceptively simple but transformative way – by learning to become an inner ally rather than being your own worst enemy. Grounded in the science of positive psychology, this book provides insights into human performance, leadership and wellbeing and teaches practical ways to apply them in everyday life. A must read for anyone interested in fulfilling their own potential or in coaching others to do so. To win at ‘the game of work’ it is necessary to understand the strengths of all the team members and then to coach to those strengths to maximize effectiveness. This book gives any leader those essential elements, and is well worth the time to read and absorb its illuminating message. Thanks for this special contribution! If we business leaders had used this book in the past year we would have doubtless reaped the benefits of a more engaged and energized workforce. I’m confident those benefits would have shown up on our bottom line. With this book leaders can learn to recognize and unleash the collective strengths on their teams–and in the process build their credibility, career and their company! I’ve worked with several NY Times bestselling authors and the level of integrity Fatima Doman has for her content and the passion with which she shares it is contagious and incredibly helpful to the reader. If you want to improve your life and the lives of others, connecting with this content is an indispensable part of your journey to transformational change.